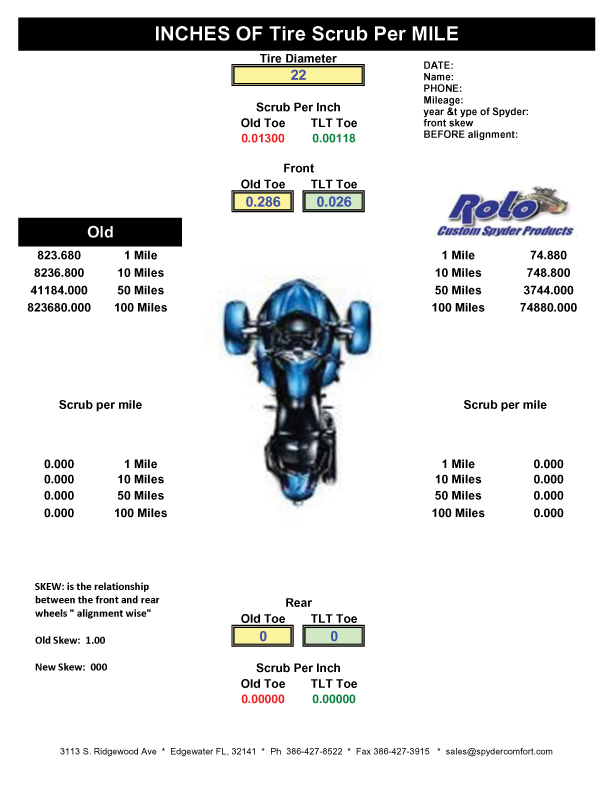 This is a copy of what is printed out for the Spyder Alignment customer AFTER their Spyder has been laser aligned using True Laser Track(TLT) patented technology. Notice the scrub on the left side, the old toe is approx. 1/4 inch( .286) and yet you are scrubbing the tires 823 inches per mile. AFTER the TLT alignment the right side scrub worksheet shows toe at .026 ( a human hair is .003) and you are only scrubbing your tires 75 inches per mile . Let's see.... what scrub would YOU like ???? Don't walk to your nearest True Laser Track/ OUTLAW/ROLO Spyder Alignment dealer... RUN !!!! #4: WHAT ARE YOU WAITING FOR ?